The Marine Theatre is right on the seafront in beautiful Lyme Regis. The location – with wide views of the sea and Lyme bay – is very important to the Marine’s identity, which makes it appealing to both the public and performers. While it’s called a theatre, the offering is much broader: there’s a vibrant programme of entertainment including bands, films, comedians, plays, and community-led events. The theatre has become recognised regionally as a vital arts centre, distinguished from others through eclectic programming. It’s a destination for performers with a national and international reputation. It also acts as an umbrella for events featuring local figures from arts, as cultural practice in the community is celebrated. The theatre is over 120 years old, but it hasn’t always been a theatre. The site has hosted many activities. 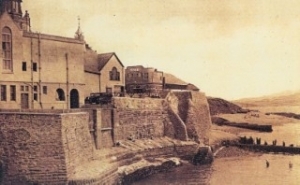 The original building was a sea water baths, opened in 1806 by Giles Davies. It pumped water directly from the ocean below. The baths and the fashionable reading room were a busy meeting place for visitors and locals alike. 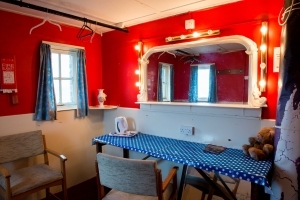 The only remaining part of the original baths is the pump-house, which now makes-up one of our dressing rooms. Sea water was a popular cure for ailments, but the healing powers of these baths was said to go beyond the doctor’s prescription. In 1890 the Dorset County Chronicle reported that ‘a saline spring has been lately discovered at Haye’s Hot & Cold sea baths (formerly known as Jefferd’s baths) which seems to possess extraordinary healing powers’. The claim went that a ‘highly respectable trademan’ had been cured by these miraculous waters. The baths fell into disuse. In March 1894 a new drill hall was opened on the site. Paid for by a local benefactor this was a training facility for local soldiers, but included the stage and many of the features you see in the theatre today. 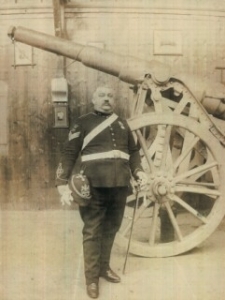 On the right is a picture of the drill hall in 1903, featuring Sergeant Britton and a training gun. The beams behind the gun are still visible in the theatre today. After World War One the building became The Drill Hall Theatre, and in the 1930s it became the Marine Cinema. The large tower on the front sea side corner was removed and the front of the building started to look at lot more like the theatre you see today. 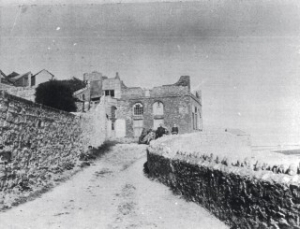 In later years the front of the building was rendered and painted white. 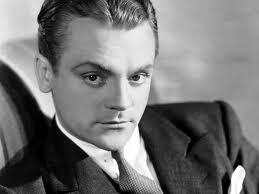 During World War Two the Marine Cinema was used as an American forces canteen and hosted performances from the likes of James Cagney, who brought with him American heavyweight boxing legend Joe Louis. In 1960 the Lyme Regis Town Council bought the building, and it reopened in 1962 as the Marine Theatre. The 60s saw appearances from bands such as The Troggs, Fleetwood Mac and Status Quo. As the decades rolled on, so the list of national and international stars who had visited the Marine Theatre grew. In 2003 the theatre was handed over to the Lyme Arts Community Trust, which has run it since. The future of this unique venue – with its incredible views and rich history – is very exciting. Come along to a performance and continue to enjoy this piece of Lyme history.